That’s right! Today is the first day of winter in Australia and thanks to Kitchenware Direct I am giving away not one but TWO Le Chasseur Round French Ovens (20cm & 28cm) to one lucky Wholesome Cook reader! Valued at $618!!! Each piece of the French-made Le Chasseur cookware is cast from solid iron and enamelled twice to protect it from rusting and to create a durable and impervious cooking surface. Available in your choice of Sky Blue or Inferno Red, Chasseur cookware performs beautifully from the kitchen to the table. Constructed from heavy cast iron and thickly enamelled, the heating qualities of Chasseur French Ovens allow you to maintain remarkably even temperatures whether simmering on the stove or braising in the oven. Chasseur French Ovens are ideal for a wide array of applications, deglaze and clean easily, and feature heavy cast iron lids with stay-cool phenolic handles that are oven safe to 200C. Chasseur has been manufacturing quality enamelled iron cookware for over 75 years. The cookware of choice for discerning chefs, enamelled cast iron is prized for its versatility on the flame and in the oven, its even heating properties, its exceptional browning abilities, and the ease with which it can be used and cleaned. 1. Leave a comment on this post, only one per person. Donated by Kitchenware Direct, the prize includes: 2 Le Chasseur Round French Ovens in your choice of colour: Sky Blue or Inferno Red. Capacity: 2.3 litres & 6.3 litres Diameter: 20 cm & 28cm. Valued at $618 (incl free postage). Note: Not suitable for glass and ceramic hobs. Induction Compatible. Competition is open to anyone with and Australian mailing address. Competition closes midnight (regardless of where you are), Sunday 10th June. Winner will be chosen at random and announced in this post on Monday 11th June. I would make a Korean healthy stew called SamGyeTang, which is basically boiled chicken with glutinous rice, dates, garlic, etc. Martyna, I love Chasseur products and used to sell them once upon a time when I co-owned my cookware store! Such wonderful quality! If I won, I would make a braised beef and vegetable dish with vanilla (watch my web site for the recipe very very soon). Mmm I would make a cobbler, with the pan on the stove top brown the meat, saute the onion and garlic, toss in flour, add wine herbs, stock and other vegetables and cook in the oven for 2hrs on a medium low heat (180C) with the lid on. Make a wholemeal herb and cheese scone mix, cut into rounds and put on the top of the meat and veg, with extra cheese or milk wash if you like turn up the heat to medium high (210C) and cook for 20 minutes with the lid off until golden. Serve straight from the stunning dishes at the table YUM! I would love to create a guiness beef stew for my husband and his parents, to remind them of home (back in Ireland) warm up their insides on these cold winter nights..served with freshly baked soda bread.yum! The red dishes are amazing, I love them. I would make an awesome curry that I was just given the receipe for. It uses lamb shoulder, so needs to be cooked low & slow, to make it tender & yum! It uses authentic Indian spices & fresh vegetables. Perfect for those cold winter nights & nice & healthy! I don’t know what I would cook but I’m sure it would come out delicious in one of these! My mum used to make the yummiest food using pots just like these.. I would try my very best to make some just as good as hers!! I’d cook a hearty delicious beef casserole with tons of chunky vegetables. Yum! Ive signed up via email. Oh what a fabulous giveaway!! I would love to make a Rabbit Chasseur!! (Good old english rabbit stew!) Just to bring a lil british back into our aussie lives 🙂 And since its a great winter recipes!! Well, it is called a ‘French Oven’ 🙂 ! So, tho’ everything from a curry to a stew to a braise etc et al would cook beautifully in this, I would ‘christen’ it with an absolutely French classic . . . that of Beef Bourguignon – a dish that spells evermore what one can achieve with the right ingredients, some time and lots of love . . . . Oops, would really have to think about the wine also, both for cooking and enjoyment of the cooking . . .
Guinness Beef Stew with hearty winter vegetables, or a lovely lamb roast in a red wine and garlic jus with roast potatoes, pumpkin and onions. The red set is devine!!!! There is almost nothing that I wouldn’t make in these! We have been eyeing them off for a long time but our budget hasn’t stretched that far. Lamb Shanks would be the first lot, Then dumplings, Then a big pot of soup and when New Years comes around they would be the perfect pot for making Olibollen! A damper or stew a casserole or 2. maybe chicken soup, some curry’s, stroganoff even delicious sweets for my mottley crew. I would love this! I have always wanted Chasseur cookery, but never been able to afford it, not even remotely close. I would probably use these every night to cook. I used to be the fussiest eater ever (not even classics like lasagne would tempt me) but have recently discovered the magic of vegetables and foods other than instant noodles. I would cook up a hearty beef stockpot….warming in this cold winter weather!! I would be adventurous and try to make a delicious lemon dessert in the French Oven. I would love to make a delicious winter casserole to warm us all up! I’ve never owned any cookware worth over $100. Would love to make a real french casserole. I borrow Mum’s Bessemer pot for a lot of dishes. Her homemade stew (similar to Boeuf Bourguignon) is one of my favourites. She has also started cooking African-style curries, but never has big enough cookware. 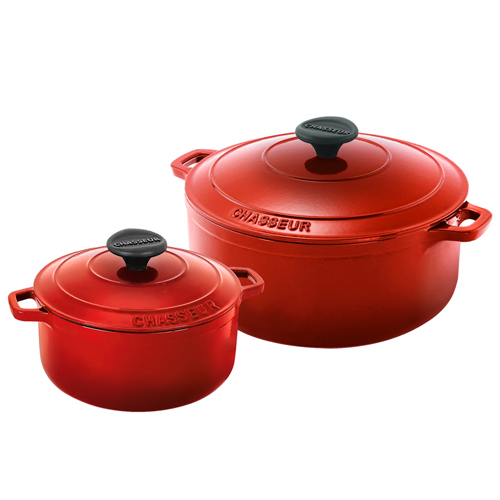 I would love for us to have Le Chasseur cookware…we could have one each (and borrow the other if we needed it). Shared on FB 🙂 I would cook in my lovely new Chasseur Round French Ovens a nice curry and my famous Osso Bucco! Yummmy! I would make a beautiful braised red wine daube with onions, parsnips, carrots and leeks. What a fantastic prize!! I would make a classic French Beef Bourguignon in the big one and French onion soup in the smaller one. Yum!!! I would make one of family’s favorite winter dishes, a lovely beef casserole, you can’t go past it on a cold winter night. *hugs* Thanks for the comment anyway! I should see about having a giveaway for my North American friends someday soon! 😀 And to Singapore too pretty please – am currently here in the sweltering heat XO! WoW that glowing red! This is just so mouthwatering on its own! Right back to the original Diane Holigue recipes for a classic coq au vin for us. Great competition, I’d make a beef daube, lamb rogan josh, lamb shanks.. these pots are endless flexible. I’m really missing having access to good cookware at the moment! I would use these ovens to make a range of yummy casseroles, stews and curries! Fresh herbs + tomatoes from my garden and some red wine (some in the dish, some for me) add that extra goodness to my favourite beef casserole mmmm..
Hi what an awesome prize. I have a Chasseur girdle pan and love, love, LOVE it. It would be great to add to the collection (Red to match the girdle). I would get my husband to cook his famous home made baked beans in the Chasseur pot. We would be having hearty, warm and filling breakfasts for weeks! I’m going to use it to bake sourdough bread ala Tartine Bakery. Good heavenly crusty bread perfect accompaniment for stews and soups. I’d cook your Beef Bourguignon, of course… at least once every fortnight! I love making homemade soups all through winter so these dishes would be so perfect! I love both colours ! I love this whole entire comp ! So awesome ! Well done ! I would love to win these! However I do have a glass cooktop, so that means I’ll have to get a new one! I’d love to make a hearty winter chicken soup! I also love the blue, would go so well in my kitchen! Super excited for this prize! My children have always wanted to know what rabbit tastes like. So, my ‘first’ dish in the Chasseur Round French Oven would also be a’ first’ for my children. I’d buy a rabbit from our local butcher, season it, add large chunks of onion and carrot and bake it slowly. Long green beans, creamy mash potato and freshly baked rolls would add the final touches to this wholesome dish of ‘firsts’. My Grandmothers recipe for braised steak and onions. It would almost be like having her back for one last meal. Aww… these are so pretty! I love to make pot roast, beans, pulled-pork… and with the small one no-knead bread! I’m crossing fingers! Come to me~~. Darn! Good luck to everyone else – what an amazing giveaway! Awesome giveaway! If I won these, I would make my dad’s famous chicken tortilla soup! I’d make broccoli cheese soup!!! I also subscribed via email… Thanks for the chance. If I won these, I would be making so many things in them especially during the winter months. Soups, bread, fruity desserts, but best of all, I would be working on incresing my repetoire of healthy casserole type dishes from all over the world! I’ll subscribe to email and share on my facebook daily. I would make a lovely cauliflower and cashew biriyani – perfect for a meat free winter meal. I would make a classic beef and red wine dish. I would make the filling for beef canneloni. A couple of hours slowcooked on the stove, making my house smell divine in the meantime! love to win the lovely blue Le chasseur sast iron ovens, so i can make winter casseroles and soups . French Chicken in this gorgeous French cookware would go together beautifully, especially with a glass of French wine. Wow…my husband (the cook in our family) would love this. Not sure what he would choose to cook in but i would love some pea and ham soup cooked on the Aga. YUM! A green curry chicken in the beautiful red pot – how colourful! I would live to own some Chasseur pieces. Perfect for creating a decadent Cassoulet with delicious free range pork belly, indulgent duck and home made Toulouse style sausages. Perfect winter comfort food ! My grandma’s family recipe for Asian braised beef ribs. Am about to renovate and at this point don’t have funds for new kitchen … But with new French ovens the old kitchen would FEEL new! Would go pot roast crazy. A vegan dahl with fresh root vegies from the local organic market! Yum. The pans look gorgeous! I have been meaning to buy something from le Creuset for a long time. Good luck to all the Australians! I’d choose the ripping red one because I’m sure it would cook a lot faster and on these chilly winters day’s I would whip up a tasty rabbit stew, wholesome and healthy. I would cook a lot of curries. i would love the blue set as it would compliment my La Chasseur frypan that i use all the time. Very elegant French Cast iron cookware for healthy cooking using healthy method. Veal Osso Bucco in a blue a Le Chasseur round oven: perfect! Not only would it be cooked perfectly, it’d look good whilst cooking. A Lamb HotPot! My Winter fave, and always soooo yummy! I would make Hubbys favourite which is lentils, lamb, barley, wheat, all spice, salt, pepper, flour, coriander, ginger, garlic, cumin, mace. A traditional meal that I don’t cook well with my junk shop pots!! Shared on facebook and twitter (AlohaHoney68). I would make my delicious Coconut Chicken Curry and my mum’s Seafood Paella – fabulous comfort food perfect for Winter! This sounds great! I would love to make some biryani in it! One off of the best thing you can have in your kitchen. Lamb Ragout. Oh, the smells that will fill the house! Can New Zealanders join 🙂 I would love to have that. Hi Raymund, unfortunately they can be only shipped to an Australian address… They weigh a ton. If you know someone (other than me – it would be unfair on others) who will hold it for you, I will count you in the draw. My grandmothers recipe – Lamb Casserole with Herb Dumplings. My grandmother swears by her Le Chasseur cast iron oven and I listen to my grandmother when it comes to cooking! Oxtail Stew. I havn’t cooked it for years. I think it is about time I did. I would make some great french onion soup. I am already looking forward to chilly weather to make a pot roast! These dishes (and yours) are beautiful! I would make taco soup. Would cook perfectly in this! I would like to make a soup we eat in Mexico called pozole. It is made with hominy kernels, chicken, tomato and dried chiles such as chile guajillo and chile ancho. Yumm! Those are the coolest! I would make my own stew I believe. I love these beautiful pots! Absolutely amazing to make any slow cooked dishes, in particular I would make a rich osso bucco or a ragu in them. Or even a roast chicken! Also want to make a chocolate self saucing pudding in one as they tend to cook them just perfectly. These are the one thing my kitchen is missing to create such delicious meals as chicken noodle soup, garlic and lemon chicken casserole, and authentic chilli con carne! Probably Osso Bucco, never made it but always wanted to! this style of cookware is indispensible in the kitchen, you can take it from stove top to the oven. brown your meat and add your stock then either turn it down real low on the stove or on low in the over for delicious slow cooked stews and goulash, and bourguinon. I would want the red one if I won. Thanks. Love the blue pots! I’d make a lovely warm pot roast, perfect for winter evenings. Love the red ones…. will be making Coq au Vin for starters, long flavour filled soups, beef stronganoff…. so many options…. The largest would be perfect for braising meltingly tender lamb shanks, while the smaller would be used to pair a warm oozy chocolate pudding for dessert!! Only in winter would I be that Indulgent, but this cookware deserves celebration!! With winter here I’d start with a yummy casserole and my husbands favourite, lamb shanks. And then I’d buy a recipe book filled with recipes for cooking in French Ovens, start at page 1 and cook my way to the end. I’d be in heaven! I would make soup or stew. This would be perfect to make Italian pasta sauce. My husband and I are trying to learn how to do this. My husband’s Italian grandmother and mother have given us their recipe and it is just a matter of trial and error. I am a follower via Rss reader feed. Oh, my dream! I’d love to make a good veggie chili. Le Chasseur cookware looks so great and makes cooking so exciting. I know my first dish would be our favourite “Cajun Chicken Gumbo”, it is a dish that I enjoyed so much when I was living in America with my boyfriend, now husband. I love the okra and spices that give it a flavour like nothing else we cook, love it!